Perfect for quick rinseless washes! The Optimum Waffle Wash Pad is a super-soft, open cell foam washing sponge, perfect for both involved washes and quick rinseless and waterless washes. The high quality, waffle shaped foam absorbs an extreme amount of water that provides an effortless glide across your paint. The only thing Optimum Waffle Wash Pad leaves behind is a clean surface. Every wash you give your car comes with a slight risk – the risk of instilling light swirls and scratches. But, if you use a washing medium designed specifically for washing, that risk goes down immensely. The Optimum Waffle Wash Pad uses its unique waffle design to draw dirt, dust, and other debris into the sponge and away from your paint. Since there is nothing to drag across the surface and scratch, you’re left with simply clean paint! 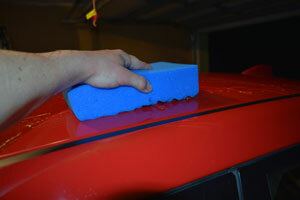 Use Optimum Waffle Wash Pad during a rinseless wash for a safe and effective cleaning method. The unique waffle design grabs dirt and traps it in the sponge - safely removing it from your paint! 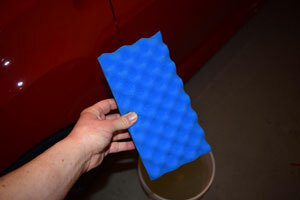 Upon testing here at Autogeek, we found that the Optimum Waffle Wash Pad is perfect for use with a rinseless wash. When wet, the already soft foam becomes even softer with absorbed water and easily removes surface debris and dust safely and effectively. The block-like design allow for a firm grip on the sponge and boasts a large surface area for working. You’ll be rinsing less and washing more!